Defense has signed an agreement with the United States for the purchase of four MQ-9 Reapers. The signing took place today at the Farnborough International Airshow in England. In 2015 the purchase was postponed, but thanks to the extra money from this cabinet, the aircraft can now be purchased. The expectation is that the Reapers will come to the Netherlands from the summer of 2020. Tweet by Arie Jan de Waard, the director of the Dutch defense procurement agency, Defensie Materieel Organisatie (DMO.). The MQ-9 Reaper is a so-called MALE UAV (medium-altitude long-endurance unmanned aerial vehicle). This unmanned aircraft can be used 24 hours a day to a height of approximately 13 kilometers. The aircraft can be used worldwide for various (observation) missions. The collected information is used for intelligence products that can make a valuable contribution to military missions. It may also concern humanitarian operations or support to civilian authorities. The agreement involves not only the devices, but also sensors such as cameras and ground stations. A MALE UAV system consists of 4 aircraft and 4 ground stations. Two ground stations are required for flights from the home base and two for take-off and landing from a deployment location. Contact between the different parts of the system is done by satellite connection. The Reapers are assigned to the 306 Squadron that is being reactivated, and will operate from Leeuwarden Air Base. 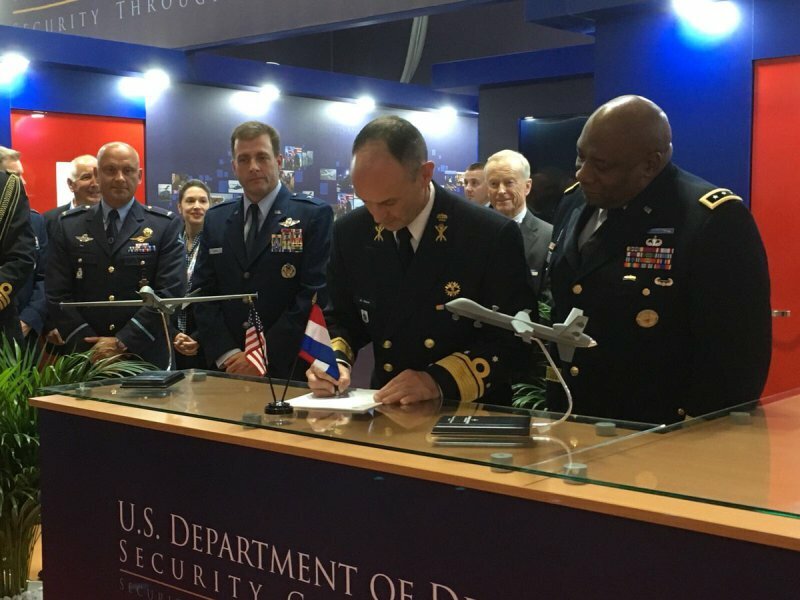 FARNBOROUGH Airshow --– General Atomics Aeronautical Systems, Inc. (GA‑ASI), the world’s leading manufacturer of Unmanned Aircraft Systems (UAS), has been selected to provide UAS to the Royal Netherlands Air Force (RNLAF). This decision follows consideration by the Ministry of Defence for the Netherlands. GA-ASI will deliver its Predator B/MQ-9 Reaper Medium Altitude, Long-endurance (MALE) UAS to the Dutch Military. The existing MQ-9 fleet has logged over two million operational flight hours with the USAF, UK RAF, Italian and French Air Forces, NASA and the US DHS. The Spanish Air Force is scheduled to take delivery of MQ-9 systems in 2019. General Atomics Aeronautical Systems, Inc. (GA-ASI), an affiliate of General Atomics, is the world’s leading designer and manufacturer of proven, reliable Unmanned Aircraft Systems (UAS), radars, and electro-optic and related mission systems, including the Predator, Reaper and Gray Eagle UAS programs of record and the Lynx Multi-mode Radar. With more than 5 million flight hours, GA-ASI provides long-endurance, multi-mission capable aircraft with integrated sensor and data link systems required to deliver persistent flight, enabling situational awareness and rapid strike.